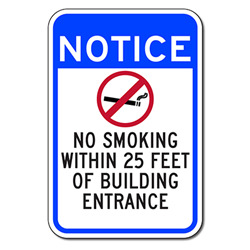 DOUBLE the working life of your Notice No Smoking Within 25 Feet Of Building Entrance Signs by adding 3M Protective Overlay Film (POF)! 3M’s high-tech POF protects sign faces against fading caused by the sun and harsh weather—and makes graffiti and sticker defacement damage easy to clear away without harsh abrasives. California Government Code Sections 7596-7598 bans smoking within 25 feet Smoking is prohibited: In an outdoor area within 20 feet of a main exit, entrance, operable window, or inside of a public building owned and occupied, or leased and occupied, by the state, a county, a city, a city and county, or a California community college district.